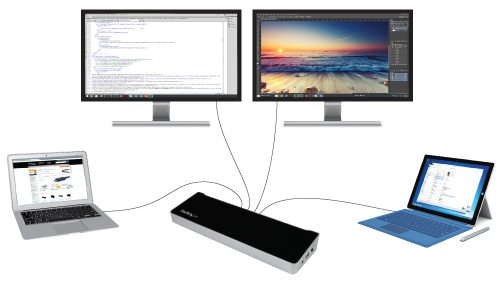 Earlier this year I reviewed the Universal USB 3.0 4K Laptop Docking Station w/4K DisplayPort. 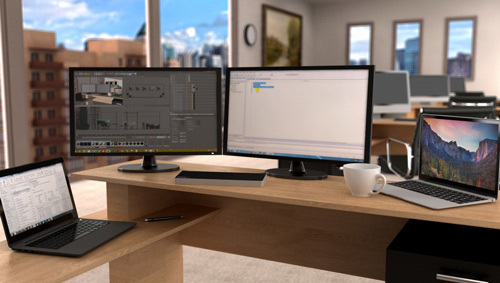 But what if you have two laptops and want or need to share displays and other peripherals on both of them? 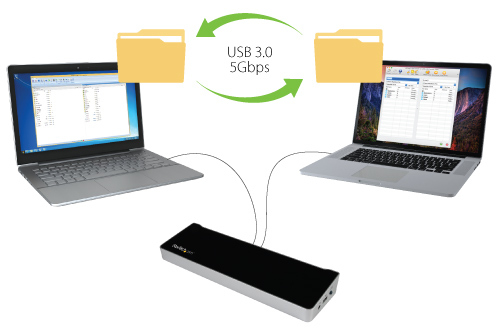 StarTech proposes a new solution with the Docking Station for Two Laptops with File and Peripheral Sharing – USB 3.0. The new dock is somewhat similar to the one I reviewed previously in terms of ports, except that it has two USB 3.0 upstream port to connect to host computers. It offers five USB 3.0 ports (one is for high speed charging), audio port, Gigabit Ethernet, Display Port, and HDMI. On the right side, you’ll find the button to switch from one connected laptop to the other. When connected on two Macs, I found that it behaved like the Universal USB 3.0 4K Laptop Docking Station w/4K DisplayPort: the mouse tracking was unstable and the display connected to the Display Port shown color shifting. It was not a huge surprise to me when I realized that the chipset in this device is also from DisplayLink. But that was when it worked. Many times when I tried switching from one Mac to the other, the display and Ethernet port did not cooperate. The keyboard and mouse connected on the dock’s USB port always worked. A reboot would help, but that’s not what a user would expect, at any price. I also tried using this new dock on a Windows computer. The DisplayLink drivers told me that on the Windows 7 installation I had a bad version of the USB 3.0 drivers. That prevented the dock to work fully on that computer. Considering that the computer was not mine, I decided not to play too much with the drivers. And because the computer was working fine for every other device, I told myself “when it ain’t broken, don’t repair it.” I stopped my Windows investigation at that point. One thing I did not like was the fact that the only way to switch between the two computers was the button located on the side of the dock. It would have been preferable to have that switch on the top-front of the device, and be a larger button. There is also no visual cue as to which computer is selected: adding two LED indicator on top with Host 1 and Host 2 tag would have helped a lot. 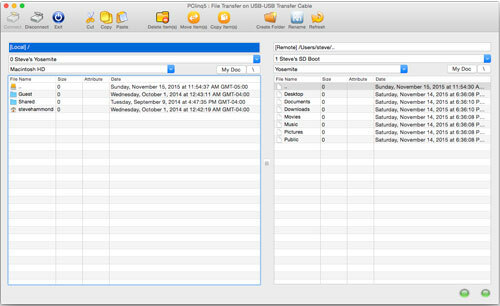 The dock can also be used to transfer files from one host to the other with provided software. This method worked fine, and at USB 3.0 speed, the file transfer was very efficient. This is probably the feature I preferred from this new product. Considering that StarTech is one of the leaders in KVM (Keyboard/Video/Mouse) switches, I wonder why they bother building a unit with display sharing over USB 3.0. If I had been the engineer or designer behind this device, I would have made the KVM functionality on one side of the dock, and a USB 3.0 and Gigabit Ethernet sharing device on the other side. Considering that the display functionality would be hardware only, it would prevent driver issues and color shifting. I was not very impressed with the Docking Station for Two Laptops with File and Peripheral Sharing – USB 3.0. 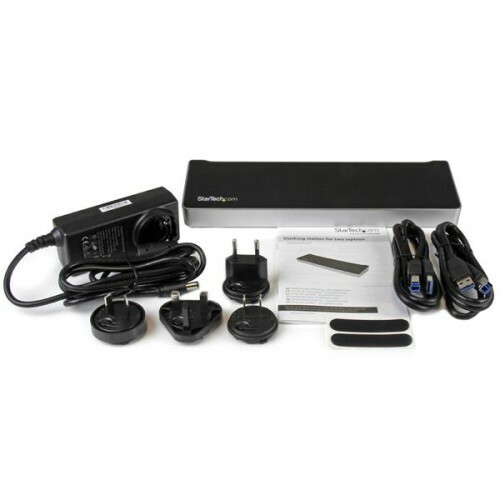 I am not going to recommend it to anyone, until StarTech returns with a KVM+USB dock. It was very difficult to test and the results were mixed at best. I think the basic idea behind it is sound, but the implementation is not up to the standards of this company and its user base.